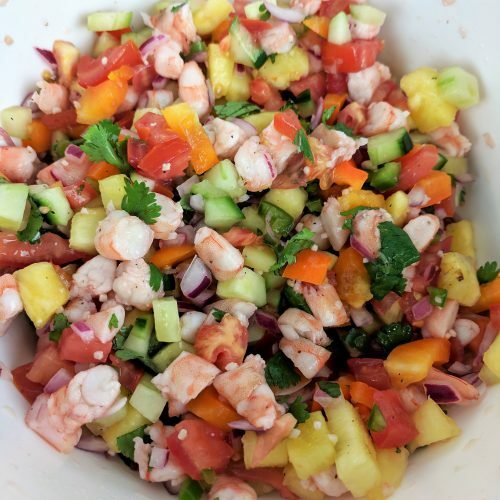 This shrimp ceviche is so refreshing and delicious! There are so many different ways to eat it, that you will never get bored! You can also switch up the protein and create different flavors every time you eat it! 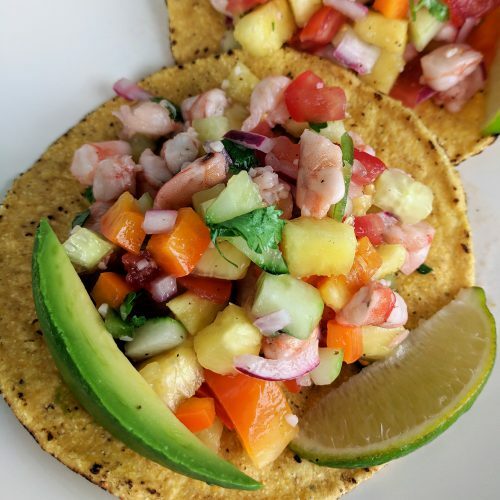 I love ceviche, mainly because of The Fish Shop in Pacific Beach (they actually have multiple locations now!). They have mahi mahi ceviche or shrimp and both are delicious. I get it almost every time I go and have always wondered if I could make it at home. Years later, I have tested my hand at it! It took me two tries to get it right, but have no fear, I will let you know my mistakes so that you don’t make the same!! do NOT use bottled lime juice. The fish/shrimp will not cook! It takes more work but you must use fresh limes to get the juice! 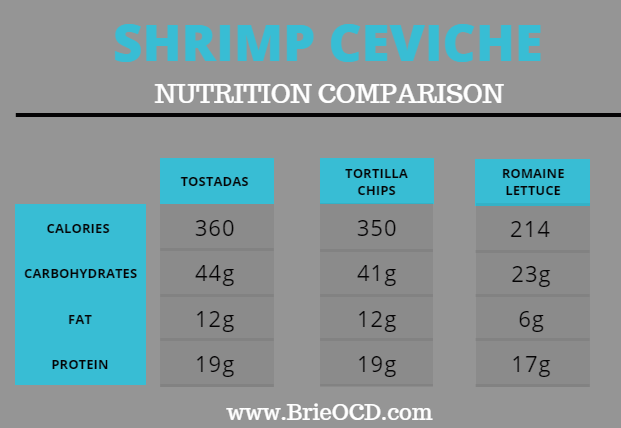 do not use big chunks of fish or shrimp. They will not cook in the lime juice! I bought 16-20 count the first time and I swear to god a week later it still wasn’t cooked. Buy 31-35 or smaller and cut into small pieces. boil the shrimp for 90 seconds to 2 minutes before placing in the lime juice to finish cooking. It cuts down on the marinating/cooking time significantly. Please note: the water will not actually come to a boil and stir constantly for the 90 seconds to 2 minutes. 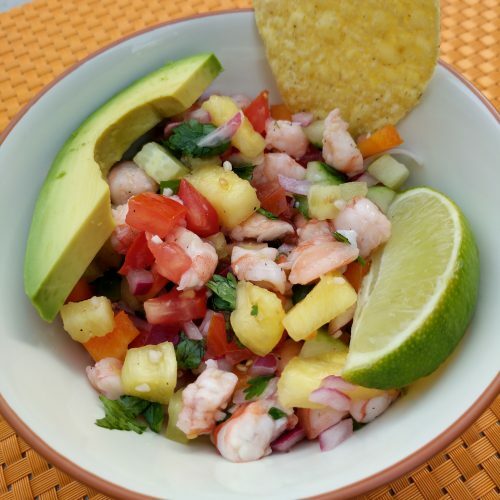 This ceviche is delicious with sliced or cubed avocado and lime wedges! There are so many ways to serve it! You can serve it on crispy tostadas, straight up with Tortilla Chips or in Romaine Lettuce leaves. Any way you serve it, it is refreshing and delicious! 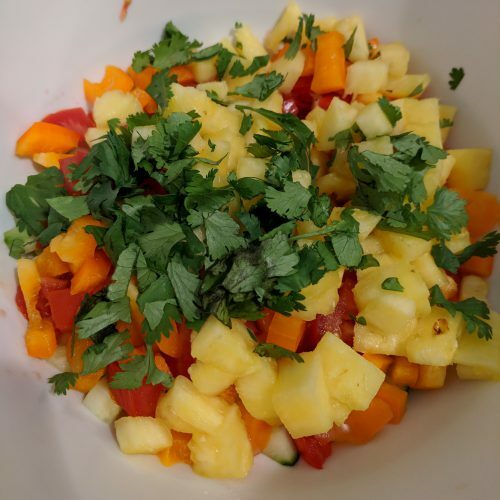 The pineapple really brings out the vibrancy in this dish and is a nice complement to the lime juice. See chart below for all three options nutrition information. 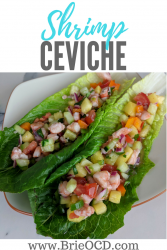 Serving the ceviche either plain or on romaine lettuce is the best way to reduce the carbohydrate, fat and calorie content without giving up much protein. You can also reduce the carbohydrate count by reducing the pineapple BUT it’s so delicious that I don’t recommend doing that! An ice bath is literally just a bowl with ice in it. 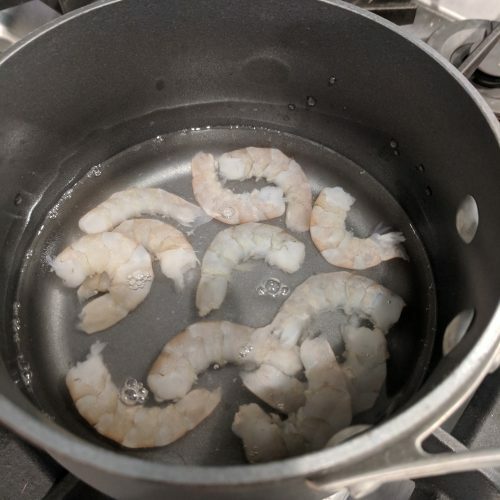 After you boil the shrimp for 90 seconds to 2 minutes you want to immediately throw the shrimp into an ice bath to stop the shrimp from cooking. I already said it above but make sure you use FRESH lime juice! The first time, I got lazy and used half fresh and half bottled and it didn’t cook the shrimp! Another note is that some people use the lime juice that just cooked the shrimp in the final dish. I do NOT. I throw that juice away and then combine the veggie and shrimp mixtures. I then squeeze one fresh lime over the combined mixture. Something doesn’t sit right with me about using lime juice that just had raw shrimp in it. But to each his own! 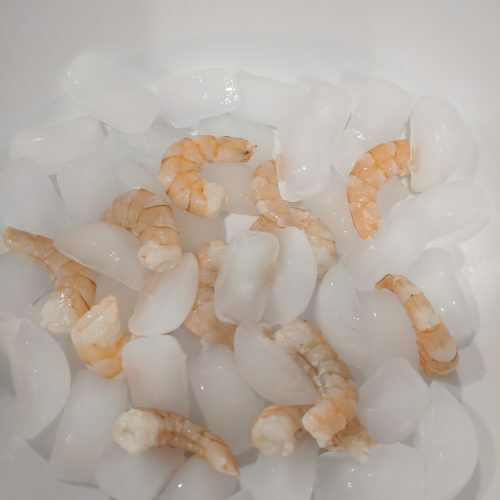 immediately place shrimp in Ice bath (mixing bowl with ice) to stop the shrimp from cooking. dice shrimp and put into a small Tupperware container. 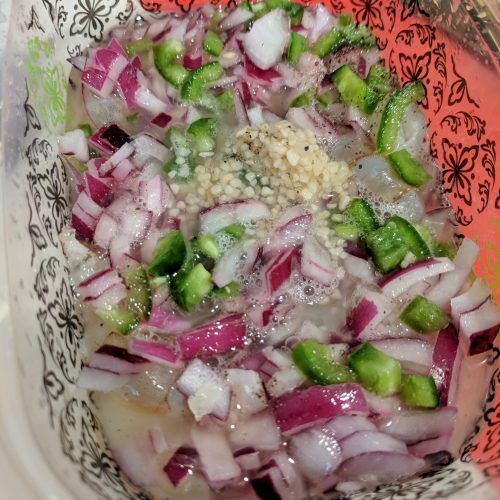 add diced jalapeno, diced onion, salt, pepper and minced garlic. fully cover mixture with FRESH lime juice (NOT bottled!) cover Tupperware and refrigerate for approx 30 minutes or until shrimp is pink and no longer translucent. 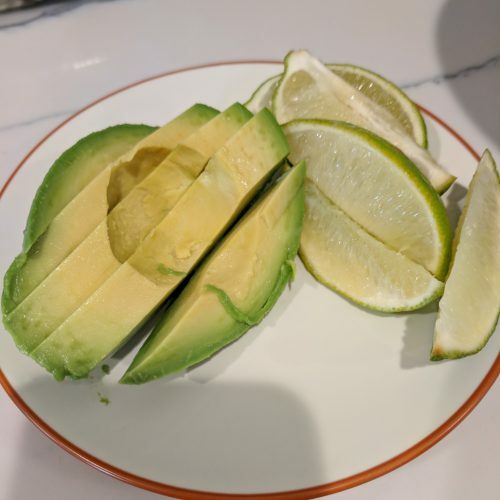 cut lime wedges and slice or cube avocado. drain juice from shrimp mixture and add to the veggie mixture. add the juice of 1 lime (or to taste) to the bowl. Stir and taste. Add salt and pepper to taste. 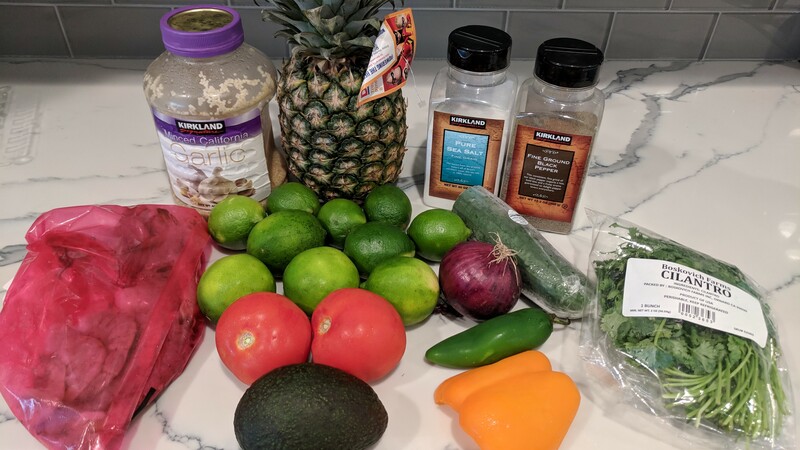 serve on tostadas, or on romaine lettuce or with tortilla chips! 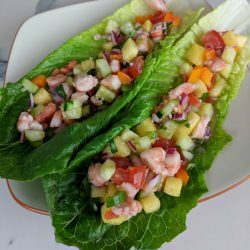 serve with lime wedges and avocado! Looks delicious, I am going to make this dish this weekend and I will let you know how it comes out! Can’t wait. Love your blog, lots of great information and love your funny stories!